The On-demand economy has changed the landscape of the business world. There’s no denying to this fact. The on-demand market will hit $533.5 Billion by 2025. More than 45 Million users in the USA itself have offered On-demand services. Around 22.4 Million users spend around $57.6 Billion for accessing On-demand services annually. In the transportation industry alone, the investment made in On-demand services has tripled in the last 12 months. Such statistics prove how the booming On-demand economy is not going to settle down soon, implying it has become imperative for every business vertical to discover the potential in their business processes and get a ride into the uprising Uber for X wave at the earliest. Taking the point that businesses across verticals should think about expanding in the on-demand domain, in this article, we are going to look into one such industry that has just made a new entry in the domain – Fuel Delivery. The business field has introduced the concept of On-demand fuel delivery, under which fuel is delivered to the customers whenever and wherever they want. The users need not run towards any gas station to get their car tank filled and make their daily commute hassle-free. The gasoline supply is made available to their doorstep with the help of a mobile app. Gone are those days when you were supposed to head towards a fuel station and stand in a queue to get your car’s tank filled or keep some extra fuel in a container as a backup. Today, with the help of On-demand gas delivery service, you can get access to fuel at any time and anywhere. Again, the fuel available at any gas station is stored for a long time. This affects the quality of the fuel. Whereas, in the case of On-demand fuel delivery, the fuel is filtered and delivered frequently, which ensures high-quality. The service of getting fuel on-demand is also providing users with emergency roadside assistance, including delivering fuel in an area far away from any gas station or repairing inflated tires. The on-demand fuel delivery apps like Filld and Booster are not only enhancing the experience of users, but also that of fuel service providers. It is providing them with an escape from a huge investment in starting, maintaining and running a fuel gas station and other associated legal and financial terms. This, as a whole, is helping them to earn more profits with lower investment. When talking about filling car tanks at the gas station, many users resist standing in a queue. They leave the gas station soon, making the gas station service providers lose their potential customer. Now, on-demand fuel delivery service option, in this scenario, helps them to keep their potential customers hooked to their brand by catering to their needs wherever and whenever they want. So as we saw, the On-demand fuel delivery as a business model has a very high potential in the market – a potential that a number of on-demand fuel delivery service providers are already taking advantage of. But, considering the rising competition, it is necessary for fuel delivery companies to know how to succeed on-demand business in a crowded market, one way of which is to study the existing market and determine what features to introduce in your mobility solution. 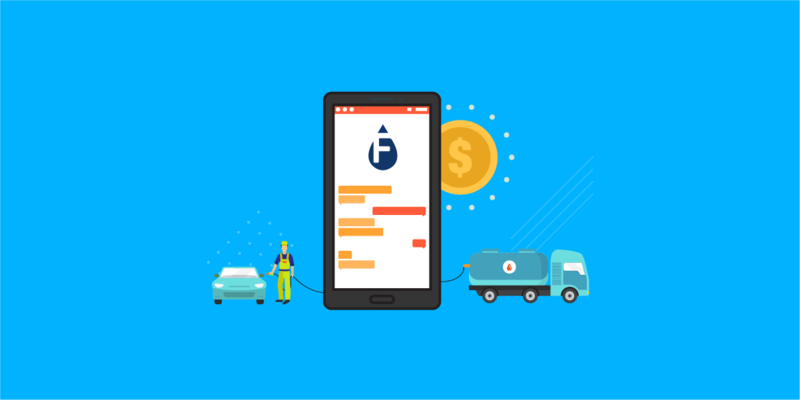 Taking the same thought forward, we will now cover a set of basic features to consider in ‘Uber for Fuel’ app development, after which we will look into On-demand fuel delivery app development cost. The first must-have feature to look into while designing apps for On-demand fuel delivery is an easy and quick registration process. Here, you can provide users with an option to either create a new account or sign up using their social media credentials. This section is dedicated to entering your personal information, your vehicle details, and that of your location, using which the on-demand gas delivery service providers could provide better services. Another feature to have when looking for an answer to how to develop an On-demand fuel delivery app effectively is location sharing. This feature gives users an escape from calling drivers to direct them to their exact location. It provides them with the facility to pinpoint their location on an integrated map that further guides the driver to reach on time and deliver the fuel. Being the prime feature of the application, it lets the customers pick the type and quantity of fuel to be delivered in addition to the time and day of availability. This streamlines the complete process of On-demand fuel delivery and ensures higher advantages to both customers and gas service providers. With this feature, the users can keep a real-time track of their gas delivery request. They can check which driver is coming to refuel their vehicle and which route they have taken, which can further help them to get an estimate of the fuel delivery time. This, as a whole, helps to enhance the customer experience. 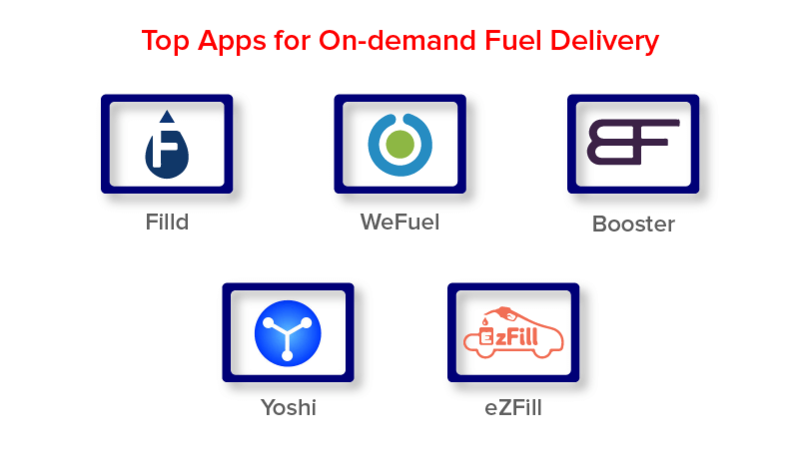 Another integral feature that makes an On-demand fuel delivery application popular like Filld, Booster, and WeFuel is Payment integration. As covered in detail in our Payment Gateway Integration blog, this functionality enables the customers to pay for the gasoline delivery service via different ways, including debit/credit cards, e-wallets like Google Pay, net banking, mobile payment, cash, etc. 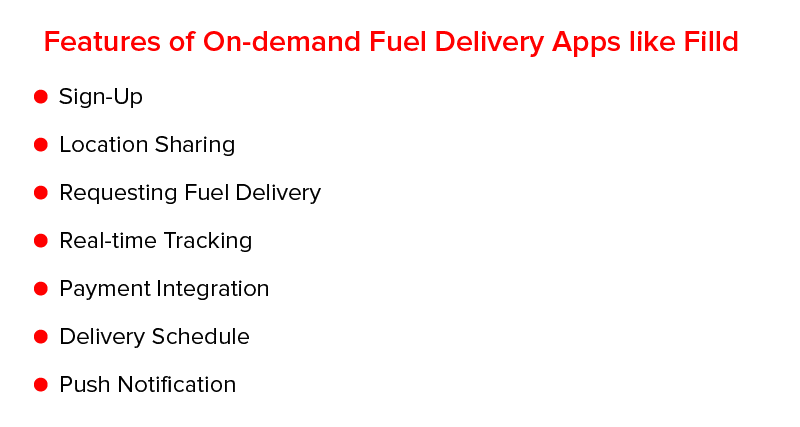 When it comes to On-demand fuel delivery app development, another feature that leaves a significant impact is the delivery schedule. This feature enables users to request for refueling for a particular time, which implies they need not dedicate a specific time to get their car tank refilled; it will be done while they would be busy attending other tasks. Another feature that must be considered while developing an application for on-demand gas delivery is Push notification. This feature will keep the customers informed of all the activities associated with the service they have requested. Also, it will keep them updated with the recent offers and discounts, which will help to boost customer satisfaction and promoting your business. Though often overlooked as an optional, transaction history should also be considered while designing an On-demand fuel app like Filld. This feature will give the customers an option to check the previous fuel delivery requests and bills, which will induce customer loyalty. Another feature to pay attention to while creating your own On-demand fuel delivery app is a cost comparison. This feature gives customers an insight into what fuel price is available at other places, which eventually help them to take a profitable decision. This ensures higher sales as well as improves the customer experience. With this attended to, let’s move to the last but the most awaited section of this article, i.e., the cost of On-demand Fuel Delivery app like Filld. If you are planning to build a mobile app for on-demand fuel delivery with all the features we have mentioned above, the cost range would come out to be somewhere around $40,000 to $60,000. *Disclaimer* This is just a rough value. The exact answer to how much does it cost to make an app like Filld, We Fuel or Booster depends majorly on different factors such as app features, app platform, UI/UX experience, technologies involved, testing tools used, etc. 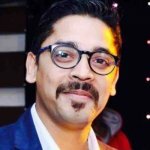 In such a scenario, the best way to find the true cost of On-demand fuel delivery app development is to consult with a reputed On-demand app development agency. “How Much Does it Cost to Develop a Cannabis Delivery App Like Eaze,�?